Freezing is the easiest, most convenient, and least time-consuming method of preserving foods. Most foods freeze well—with the exception of produce with a high water content, cream-based items, and cooked starchy foods such as cooked noodles and rice. All fresh produce contains enzymes, compounds that help the plant ripen and mature. During freezing, enzyme action is slowed but not stopped. If not inactivated, these enzymes can cause color and flavor changes and loss of nutrients during freezer storage. Also, freezing stops, but does not destroy, the microorganisms that cause spoilage or illness. For specific guidelines on freezing vegetables, please refer to the Freezing Vegetables fact sheet. Contrary to some publications or folklore, blanching is essential for obtaining top quality frozen vegetables. Blanching vegetables before freezing inactivates the enzymes. During blanching, the vegetable is exposed to boiling water or steam for a brief period. The vegetable is then rapidly cooled in cold water (60 degrees Fahrenheit or below) for the same amount of time to prevent cooking. Blanching also helps destroy microorganisms on the surface of the vegetables. When blanched, vegetables such as broccoli and spinach become more compact. Following the recommended times for blanching each vegetable is important. Over-blanching results in a cooked product and loss of flavor, color and nutrients. Under-blanching stimulates enzyme activity and is worse than no blanching at all. The use of microwave ovens for blanching has become popular. However, microwave blanching is not recommended as it produces uneven results because of varied heat patterns within a microwave oven and from one microwave oven to another. Microwave blanching requires working with only small quantities at a time; there is no time saved when working with large quantities of vegetables. For specific guidelines on freezing fruits, please refer to the Freezing Fruits fact sheet. Enzymes in fruits can cause browning and loss of Vitamin C. Fruits are not usually blanched. Instead, ascorbic acid (Vitamin C) is used to control enzymes in frozen fruits. Commercial mixtures of ascorbic acid are available for home use. Citric acid or lemon juice also may be used to prevent darkening of fruits, but they are not as effective as ascorbic acid. Packing fruit in sugar or sugar syrup will also control browning, but not as effectively as ascorbic acid. For specific guidelines on freezing meat, poultry and game, please refer to the Freezing Meat, Poultry and Game fact sheet. Another type of change that can occur in frozen products is the development of rancid off flavors. This occurs when fat, such as in meat, is exposed to air over a period of time. It can be controlled by using a storage method that does not allow air to reach the product. Therefore, it is always advisable to remove as much air as possible from the freezer bag or container to reduce the amount of air in contact with the product being frozen. 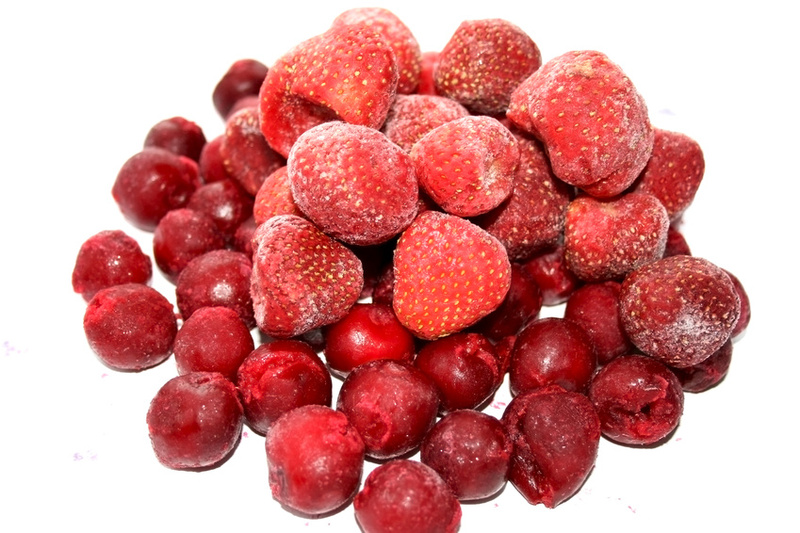 To maintain top quality, store frozen fruits and vegetables at 0 degrees Fahrenheit or lower. The only way to be sure your freezer is at the right temperature is to use a freezer thermometer. Storing frozen foods at temperatures higher than 0 degrees Fahrenheit increases the rate of deterioration and shortens the shelf life of foods. Fluctuating freezer temperatures can cause the ice in the foods to thaw slightly and then refreeze. Every time this happens, the smaller ice crystals form larger ones, further damaging cells and creating a mushier product. Moisture loss, or ice crystals evaporating from the surface of a product, produces freezer burn—a grainy, brownish spot where the tissues become dry and tough. Freezer-burned food is likely to develop off flavors, but it will not cause illness. Packaging in heavyweight, moisture-resistant materials will prevent freezer burn. Suitable packaging materials include rigid plastic containers with straight sides, glass jars made for freezing and canning, heavy-duty aluminum foil, moisture-vapor resistant bags, and freezer paper. Containers intended for short-term storage, such as bread wrap; cottage cheese, milk or ice cream cartons; regular aluminum foil; or waxed paper do not provide effective protection against flavor and moisture loss or freezer burn during long-term storage. 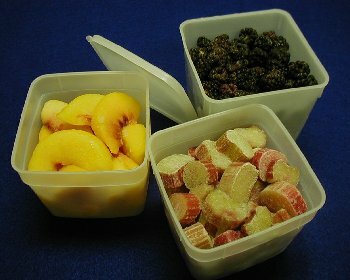 Plastic containers designed for long-term freezer storage may or may not be suitable for direct use in a microwave oven. For specific guidelines on freezing cooked foods, please refer to the Freezing Cooked Foods fact sheet. Cool all foods and syrup before packing. Pack foods in quantities that are usable for a single meal. Pack cold foods tightly into containers. Because most foods expand on freezing, allow ample headspace (space between food and closure). The amount of space needed will vary depending on the food and size of containers. When packing food in bags, press out excess air before sealing. Label and date each package. It is also helpful to list number of servings on the label. For quick freezing, spread packages among already frozen foods. Leave a small space between packages and add only the amount of unfrozen food to the freezer that will freeze within 24 hours: about 2 to 3 pounds of food to each cubic foot of freezer capacity. Freeze foods at 0 degrees Fahrenheit or lower. To freeze foods rapidly, set the temperature control at –10 degrees Fahrenheit or lower 24 hours in advance. Keep a thermometer in the freezer to assure proper freezing temperatures are maintained. Freeze foods immediately after they are packaged and sealed. Do not overload your freezer with unfrozen food. Overloading slows down the freezing rate, and foods that freeze too slowly may lose quality. Place packages in contact with refrigerated surfaces in the coldest part of the freezer. Leave a little space between packages so air can circulate freely. Then, when the food is frozen, store the packages close together. For specific information, please refer to the What to Do When Your Freezer Stops fact sheet. Keep the freezer closed. If it looks like the freezer will be stopped for more than 24 hours, use dry ice (if you can get it) or move the food to another freezer. • So Easy to Preserve. (Sixth Ed.) (2014). Cooperative Extension Service. University of Georgia, College of Agriculture, Athens, Georgia. Information compiled by Ruth Anne Foote, Extension Educator, Family and Consumer Sciences, Ohio State University Extension. Revised by Pat Shenberger, Ashland County Extension Educator, Family and Consumer Sciences, Ohio State University Extension. Updated by Barbara Rohrs, Extension Educator, Family and Consumer Sciences, Ohio State University Extension, Defiance County. Reviewed by Christine Kendle, MS, RD, LD, Tuscarawas County Extension Educator, Family and Consumer Sciences.